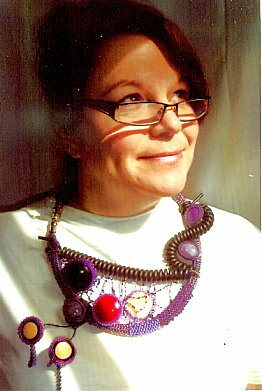 Eight Jewelry Artists from around the world have been selected as Semi-Finalists of The 9th International 2012 The Ugly Necklace Contest – A Jewelry Design Competition With A Twist, by a panel of four judges from The Center for Beadwork & Jewelry Arts and Land of Odds. 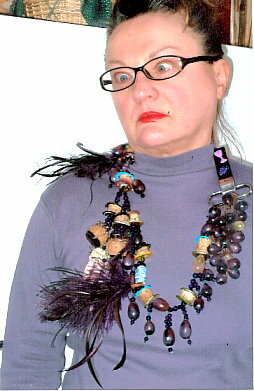 So the many jewelry designers from across America and around the Globe who entered our 9th International 2012 The Ugly Necklace Contest — A Jewelry Design Competition With A Twist , found this contest especially challenging. After all, your brain is pre-wired to avoid and reject things which are ugly. Think of snakes and spiders. And even if you start your necklace with a bunch of ugly pieces, once you organize them into a circle, the very nature of an ordered round form makes it difficult to achieve Ugly. Yes, “Ugly” is easier said than done. Who will win? We need the public’s help to influence our panel of judges. Our respected judges evaluated these creatively-designed pieces in terms of hideousness, use of materials and clasp, the number of jewelry design principles violated, and the designer’s artistic control. 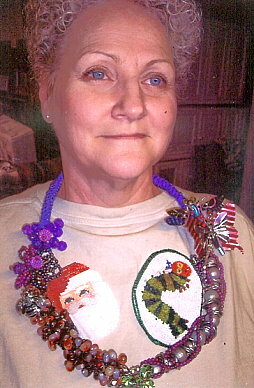 Extra points were awarded for artists’ use of smaller beads, because it’s much more difficult to do Ugly with these. Now it’s time for America and the World to help finalize the decision about which of these 8 semi-finalists’ Ugly Necklaces to vote for. 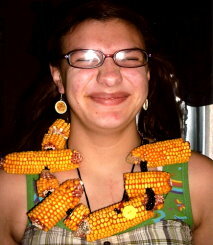 The winner will truly be an exceptional jewelry designer. The losers….well….this isn’t a contest where you really can “lose”. 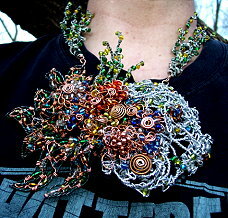 Come see these and the other semi-finalists’ pieces at www.landofodds.com, and vote your choice for the Ugliest Necklace, 2012. 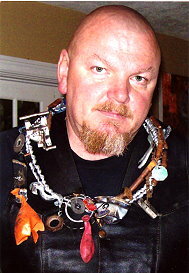 And if you are in the Nashville, Tennessee area, please stop by The Open Windows Gallery (fine art jewelry) at Be Dazzled Beads, where the 8 semi-finalists’ Ugly Necklaces are on display through September 15, 2012. 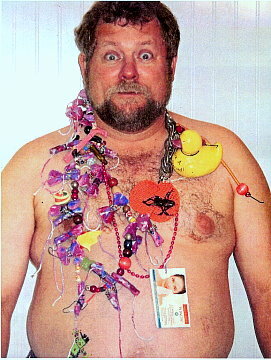 The UGLY NECKLACE CONTEST (www.landofodds.com/store/uglynecklace.htm) is a jewelry design competition with a twist. The contest presents a challenge not often tackled — at least intentionally. 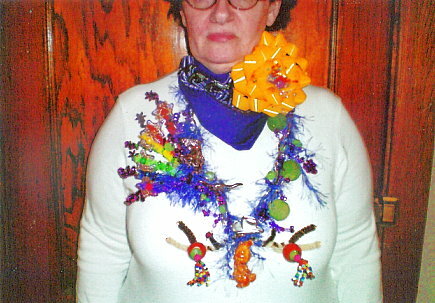 The contest draws the jewelry designer into an alternative universe where beautiful artists create ugly necklaces. It’s not easy to do. “Ugly” is more involved than simple surface treatment. It is not just laying out a bunch of ugly parts into a circle. It turns out that “Ugly” is something more than that. “Ugly” is the result of the interplay among Designer, Wearer, and Viewer. 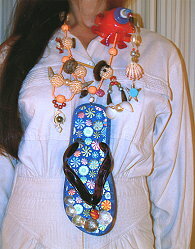 “Ugly” is very much a result of how a necklace is designed and constructed. “Ugly” is something the viewer actively tries to avoid and move away from. “Ugly” has deep-rooted psychological, cognitive, perceptual, sociological and anthropological functions and purposes. As research into color and design has shown, your eye and brain compensate for imbalances in color or in the positioning of pieces and objects – they try to correct and harmonize them. They try to neutralize anything out of place or not quite right. You are pre-wired to subconsciously avoid anything that is disorienting, disturbing or distracting. Your mind and eye won’t let you go here. This is considered part of the fear response, where your brain actively attempts to avoid things like snakes and spiders…. 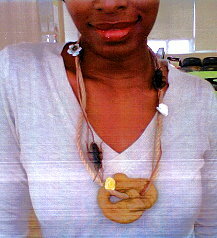 and ugly necklaces. This means that jewelry designers, if they are to create beautiful, wearable art, have to be more deeply involved with their pieces beyond “surface”. Or their pieces will be less successful, thus less beautiful, thus more disturbing or distracting or disorienting, thus more Ugly. 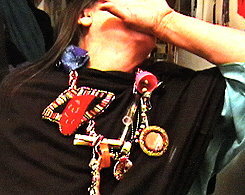 Luckily, for the jewelry designer, we are pre-wired to avoid these negative things. This makes it easier to end up with pieces that look good. Beauty, in some sense, then, is very intuitive. On the other hand, it makes it more difficult to end up with pieces that look bad. You see, Ugly goes against our nature. It’s hard to do. 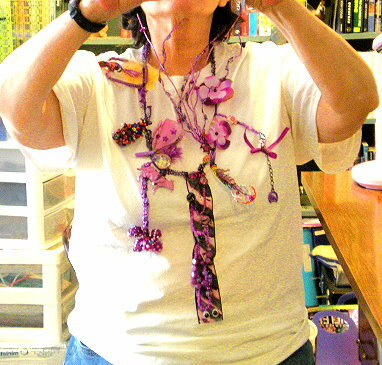 The Ugly Necklace Contest is one of the many programs at The Center for Beadwork & Jewelry Arts in Nashville, Tennessee, that encourage beadwork and jewelry makers to test their design skills, have fun, and learn some fundamentals about jewelry design in the process. and Write “Ugly Necklace Email List” in the subject line. 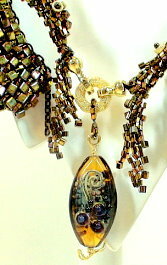 Land of Odds provides bead and jewelry making artists with virtually all their beads, supplies, books and jewelry findings needs, with over 35,000 products. 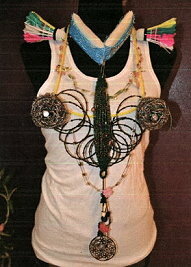 Retail/Discounts/Wholesale. 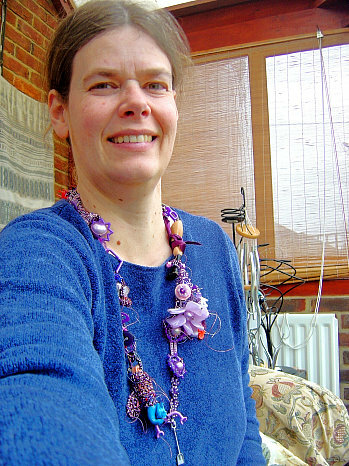 Educating beaders and jewelry makers in the Design Perspective. One of our semi-finalists will win an almost $1,000 shopping spree on the Land of Odds website! Entries due 3/15/12. Top Prize: $992.93 shopping spree on the Land of Odds website. 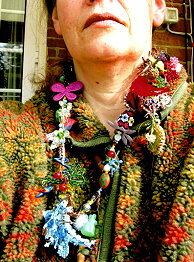 2012 Special Rule: Necklaces must consist 75% of beads – however, you define “beads” – and not be longer than 32”; the theme: “From My Garden Of….” .